The major role that King Prithivi Narayan played in Limbuwan history was the incorporation of Limbuwan lands into his Gorkha Kingdom. Following this, the Gorkha Empire became Nepal. The former ten kingdoms of Limbuwan were divided into seventeen districts; the former kings became subbas under the new king and were granted autonomy, which was eroded over time. Kipat rights included ownership of rice fields, pasture fields, forests, water sources, rivers and mineral resources. While the rest of Nepal had the “Raikar” system of land ownership, only farwest Nepal and Limbuwan had the state sanctioned “Kipat” system. The policy of autonomy to Limbuwan by the Gorkha king was to ensure that Limbus always stayed loyal to him. Thus it would be easier for the Gorkhas to both conquer Sikkim and subdue Limbu brotherns Kirant Khambu (Rais) of Majh Kirant at the same time. This was an example of the divide and rule policy of the Shah rulers. The Gorkha-Limbuwan Treaty of 1774 CE ended the Limbuwan Gorkha wars. 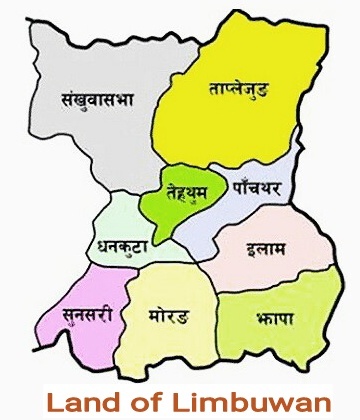 The Gorkha Bhardars, Abhiman Singh Basnet, Parath Bhandari, Kirti Singh Khawas and Bali Bania on behalf of Gorkha raja Prithivi Narayan Shah, agreed to take an oath and swear on “Noon pani” (salt-water) promising that Gorkha raja would never confiscate Limbus’ Kipat land (autonomous land) nor destroy them. If he confiscated their Kipat land and destroyed them, then the god, upon whom Gorkha Raja had sworn and put faith in, would destroy him, his descendants and his kingdom. At this swearing ceremony, a big copper cauldron was brought in front of Gorkha and Limbu representatives and one pathi (eight pounds) of salt was put into it. Limbu ministers then poured water into it and stirred properly to mix the salt with water. Then the ministers asked the Gorkha bhardars to extract salt out of the water. They answered that salt had mixed and had become impossible to extract from the water. The Limbu ministers then said: ”Although the salt has melted and it is impossible to extract it from the water, yet the water has become tasteful. You, the Gorkhas, are like water and we the Kirant Limbu people, are like salt. You Gorkhas people want us to melt in you, but you will not remain as before. When we mix or amalgamate with you, then you Gorkhas will be more exalted than before. But, if you betray us by taking our right of Kipat land, then what oath will you take for not violating this agreement?” The Gorkha bhardars, on behalf of Gorkha raja, took a handful of salt water in their hands and swore that the Gorkha raja would never betray them by forfeiting the Kipat land (self-governing autonomous land). If the Gorkha King did so, his descendants would melt like salt and disappear from the world. The Gorkha Bhardars, then questioned the Kirant Limbu ministers, saying if they will betray the Gorkha raja by violating “Noon pani” agreement what oath would they take for never violating such an agreement. The Kirant Limbu ministers took a handful of salt water and swore that they would never go against the Gorkhali king. If they did so then their descendants would also melt like salt and disappear from the world. After making such agreement on salt-water (sacred and important elements), the Gorkha bhardars on behalf of Gorkha raja gave the following treaty paper, or Lal Mohor, to the Limbu ministers of Bijaypur. When the allies of Morang Kingdom heard the news of the agreement between the Gorkha and Morong kingdoms, the Limbu rulers of Mewa Kingdom, Phedap Kingdom, Maiwa Kingdom and Tambar Kingdom also came to Bijaypur (present-day Dharan) to join the alliance with the Gorkha King under the same terms and conditions of the treaty. The rulers of the regions Papo Hang, Thegim Hang and Nembang Hang under the leadership of Chemjong Hang (ShriShun rai) decided to join the Gorkha king on the same conditions. 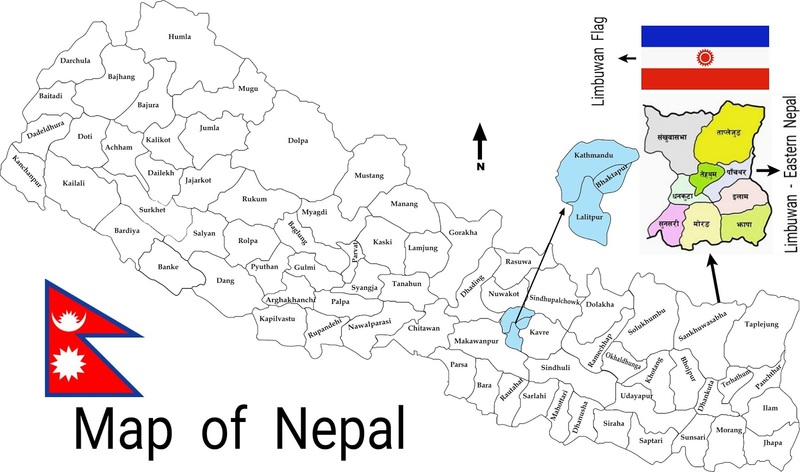 Thus the Limbuwan-Gorkha War came to an end in 1774, with all the principalities of Limbuwan joining Gorkha Kingdom except the King of Yangwarok (Kingdom of Yangwarok consists of present-day parts of Taplejung, Panchthar) and King of Ilam Hangsu Phuba of Lingdom Family. The grandson of King Prithvi Narayan Shah, King Rana Bahadur Shah’s role in Limbuwan was limited to arming the former kings of Limbuwan, now the Subbas and chiefs, to fight against Sikkim. He called them to Kathmandu and under the charge of four former kings of Limbuwan, the king of Gorkha handed about 107 guns, 935 swords and 825 bows to raise a Limbu army and fight against Sikkim. Following the occupation of Sikkim, west of Teesta River, Nepal was again plunged into a war with Tibet and eventually with China. During the war with Tibet, Sumur Lama of Tibet had taken refuge in Kathmandu. When Nepal refused to hand him back to China, the war broke out with Nepal and Tibet. At that time, the Chinese had incited the people of Limbuwan to revolt against their Gorkha king. General Tung Thang sent guns, gunpowder, cannons and other weapons to Limbus in Limbuwan. It was said that about 1000 pathis of gunpowder and 500 pathis of lead were sent to Limbus. In 1867, Dashain was boycotted in Dhankuta in protest at eroding the Limbuwan peoples’ cultural rights. The state government forced the people of Limbuwan to celebrate Dashain or else bear the consequences. This was unacceptable to the people of Limbuwan, so a revolt started in Dhankuta and spread. Gorkha rulers soon suppressed the protest and there were two deaths. In 1870, the Limbu language suppression policy of the Ranas led to another uprising in Limbuwan. Limbu script or education in the Limbu language was thought of as anti-nationalistic, so the state adopted the policy of suppressing all ethnic and aboriginal languages and cultures of Nepal. Many Limbus were either executed or chased away from their motherland. King Tribhuwan’s rule saw several changes in the system of Kipat in Limbuwan. Although Ranas had taken away the rights of forest and other mineral rights of the Kipat system, worse was to come. In 1913, the government brought in legislation that stated that any new lands that were brought under cultivation in Limbuwan would be turned into a Raikar land. This was specifically designed to target the new farm lands that had been carved out from the forest and pasture areas. But once again, that was against the spirit of the Gorkha Limbuwan Treaty of 1774, whereby the State was to let Limbus use their lands in their own way according to the Kipat system. According to the treaty of 1774 and the Kipat system, if forest land was to be turned into farm land, with the consent and approval of the Subha and Chumlung of the area, then it was not supposed to be an issue to the state. Besides, forests and pasture lands along with river and water bodies with mineral rights were enshrined in the Kipat system. In 1917, the Rana government’s unilateral legislation stated that Kipat lands of Limbuwan could be turned into “Raikar” lands if the Limbu owners could not pay off loans within six months. This was totally against the treaty of 1774, which specifically stated that the lands of Limbuwan east of Arun River could never be transferred to the Raikar system. Up to 1920 the Subha and their Chumlung also had power to hold courts according to tradition in their jurisdiction. Similarly in 1926, the Rana government introduced the Panchayat system of government in Limbuwan, accordingly these Panchayat systems replaced the Subha and Chumlung system of government in Limbuwan which was also held up by the Gorkha-Limbuwan Treaty of 1774. Limbus of Ilam rose in resistance against the government policies of gradually nibbling away the rights given them by the 1774 treaty. Thus in this way State tried to eat away the autonomy and the rights of Limbu people of Limbuwan. The most interesting and unfair part of this whole saga was that, never were any Limbu Subha or Chumlung members asked nor were their opinion taken into any consideration. Treaties and agreements are signed or dissolved with the agreement of two sides, but the Gorkha-Limbuwan Treaty of 1774 was never consulted and the state unilaterally displaced the people of Limbuwan. In the mean time, the government of Nepal continued its encouragement of mass immigration of non Limbu and non Kirant people into Limbuwan to exploit Kipat lands. In 1950-51, when there was political movement going on in rest of Nepal, there was also a Limbu/Kiranti insurgency going on in Limbuwan demanding more political rights. There was a tradition from the time of Ten Limbu Kings that whenever a new king was crowned, or a new government was formed, a delegation of Subha and Chumlung members would go to the capital city and voice their concerns. In 1960, a delegation of Limbu Subhas from Chumlungs across Limbuwan region went to Kathmandu to remind the King about the Gorkha-Limbuwan Treaty of 1774 and also to get guarantees about the rights of Limbuwan. Following his meeting with the Limbuwan delegation, the king issued royal decrees stating that the “Traditional rights and privileges of Limbu people in Limbuwan will be protected”, in reference to the treaty. In 1964 King Mahendra and his government introduced the Land Reform Act, whereby the government was to confiscate any land holdings that exceeded 1.8 hectares. This was applied to all of Nepal, but Limbuwan was a different case because lands of Limbuwan once again were under Kipat system and not the Raikar system. The land could not have been sold or owned personally other than Kipat holders anyways, it was communal belonging to a clan or group of people. But once again, going against the spirit of the 1774 Treaty, eroding democratic values and neglecting the people of Limbuwan, the government did not consult with the original people of Limbuwan or the Treaty of 1774 and went ahead with their land surveying in Limbuwan. King Prithvi Narayan Shah had agreed that he would not survey, designate or take away lands of Limbuwan from the original people. Soon after the introduction of the Land Reform Act, Subhas of Limbuwan and many other Limbu individuals raised the issue and implications of the Land Reform Act on Limbuwan and the existing Treaty. Limbus clearly knew that this was another act to erode the “treaty protected traditional” rights of the Limbu people over their lands. The situation was tense as the very next day, the immigrant non-Limbu tenants of Kipat lands who had been paying rent over a period of time, could be declared to own the land. The very existence of the Limbu people, its culture, tradition and autonomy was in danger. King Prithvi Narayan Shah had promised to Limbus that he would not survey the Lands of Limbuwan, because he did not own them but only the people of Limbuwan did. Similarly, after the 1964 Land reforms act, King Mahendra had promised a delegation of Limbuwans that he would not take away their lands, but he died without accomplishing this and failed to save the Limbu peoples’ autonomy. 1) The state had no authority over Kipat Lands in Limbuwan. 2) The state could not generate revenue or make use of Lands in Limbuwan because Limbus owned the rights to rivers, waters, forests, mines and minerals. 3) The Limbu Kipat owners can anytime ask their tenants to move away from their Kipat lands. 4) Due to its strategic location and being far away from the capital, the state had to exert its control over the people of Limbuwan by mass immigrating Hindu settlers to keep rebellious Limbus in check. Before the Land Reform Act, of Nepal’s total cultivable land, almost 95% or about 2.1 million hectares of land was under the Raikar system, and 2% or about 40000 hectares of land was under Guthi organisation. Only 3% or 77000 hectares of land was under the Kipat system. The main difference once again was that, all the lands of Nepal was owned by the state and given by the state to people for ownership under the Raikar system. Raikar lands had ownership documents given by the state and most importantly Raikar lands could be sold to anyone. Whereas in the Kipat system, communal/clan authorities owned the lands, Kipat lands were not granted because of the royal or state authority, the owner owned it because he or she belonged to a clan that owned the land for ever. Lands in Limbuwan were never conquered by the state and because the treaty existed that upheld the Kipat rights, it was illegal for the same state and authority that promised to uphold the privilege on one hand to take it away, piece by piece, by the other hand. Regmi states that the King and State had no authority over Kipat lands, communal authority was supreme. The Panchayat regime adopted the old policy of “One country one king, one language one culture”. It was sponsored by the state and Nepali language and Hindu religion was imposed on everyone. The existence of other religions, customs, languages and traditions were looked down upon and not encouraged. Since the implementation of the Land Reforms Acts, there had been protests and dissatisfacion towards the state for mismanaging, mistreating and most importantly betraying the Limbus. In 1968, a Limbu delegation that had gone to express their dissatisfaction over the single-handed treaty violation were jailed and tortured. Similarly the pioneers of the Limbuwan Liberation Front Party were jailed and tortured for three years for distributing pamphlets and trying to educate Limbus about their own rights. In 1972, some other Limbuwan Liberation members took a delegation to the new King Birendra and tried to revive the Limbuwan Autonomy issue but were soon suppressed.